While there may already be a doorbell system installed in your home, many people choose to purchase a wireless doorbell system. There are a lot of reasons to consider this; you can replace the chime with one which matches your personality, or you can extend the range of your doorbell so that you can hear it clearly throughout the house. Some units even offer special accessibility features for disabled users. Regardless of the reason for your purchase, a wireless doorbell can make an excellent home upgrade. 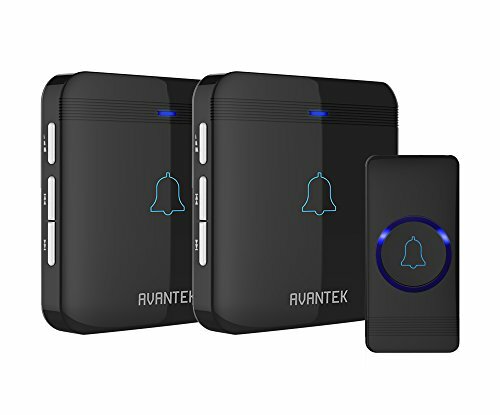 Thinking about purchasing a wireless doorbell, but not sure where to begin in your search for the right unit? Check out top-selling products in the comparison table below. Still not sure what features to look for? Read on to learn all about wireless doorbells. What is a Wireless Doorbell? Doorbells come in two varieties: wired and wireless. Wired units are more common, and they do offer a number of advantages: they don’t need batteries and typically are low-maintenance. 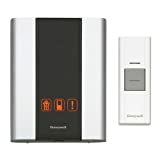 But wireless doorbells also offer some unique advantages; they consume less power and they can offer superior sound quality and range. They can be fully customized to your needs and quickly and easily installed. How Does a Wireless Doorbell Work? With a wireless doorbell, you set up the doorbell along with receivers throughout your house. These systems transmit signals without the need for wires, and typically feature a range of about 100-150 feet. This works perfectly for most small to medium-sized dwellings. If you have a larger home, you may need to purchase extra receivers or a sound extender. This can help you to extend the transmission range up to 500 feet—or in some cases even more. What range do you need? For a small home or even a mid-sized home, 100-150 feet of range should be sufficient. 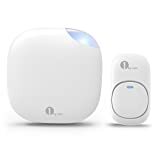 For big homes, however, you may need to buy a wireless doorbell with a much longer range, or purchase an additional range extender. Big homes often require 500 feet of range or more. You can purchase up to several thousand feet of range for mansions. Do you need special accessibility features? If someone in your household is hearing-impaired, you can purchase a wireless doorbell which includes flashing lights. This is also a helpful feature if you have a baby in the house that you do not want to wake up during naptime. How many bells do you need? If you live in a large dwelling, you may have a number of doors, and it might make sense to have bells at all of them. Some systems can easily support up to six doorbells. Do you need a weatherproof system? Weatherproof doorbell buttons are always a smart move, but in some cases you might also need to shop for weatherproof receivers. That way you can hear your doorbell ring even if you are outside, say for instance on the patio or deck. 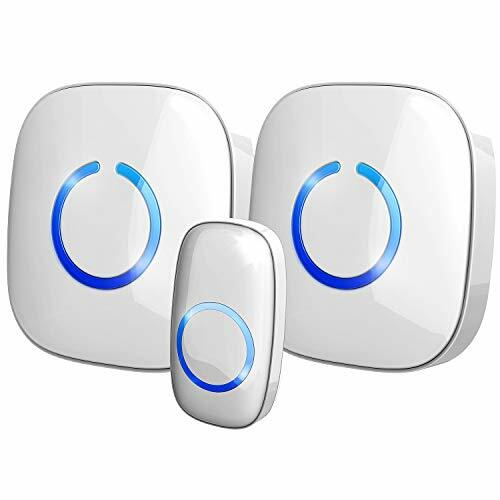 There are a couple of different installation methods which are common for wireless doorbells. One is to use screws to affix the unit to the wall, while the other is to stick the doorbell to the wall using special double-sided tape. Choose a doorbell which includes a method that won’t give you trouble. Be sure to check customer reviews to see what other users thought of the installation process. Some wireless doorbells include just several different sound options, usually traditional chimes like the popular Westminster. But others may include dozens of chimes—or even the option to load in your own personalized chimes. This allows you to fully customize the sound of your doorbell. It is useful to be able to adjust the volume of your doorbell up or down or even switch it off completely. Some wireless doorbells have an old-fashioned look, while others are more contemporary in style with a streamlined, modern look. Most commonly, wireless doorbell push buttons come in black, white, and amber, but you will find many less traditional colors as well. Plastic is the most common material, but you may find metal finishes or even covers made out of glass, wood, or ceramics. A push button which is illuminated in some way is always best since that way it can be located easily at night. Choose something that will fit with the architecture of your house and your personal style. 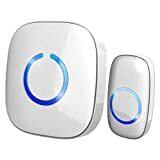 Some wireless doorbells can actually communicate with other devices, for example motion sensors which are part of a home security network. So you could have a certain chime ring when someone actually pushes the button at your door, and then set up a different chime to sound if someone merely walks within proximity after hours. That way you are always aware of what is going on at your doorstep. Purchase a wireless doorbell which includes frequency blocking capabilities. This feature prevents the doorbell from ringing in response to other signals—for example your neighbor’s wireless doorbell being pushed. The majority of wireless doorbells include replaceable batteries. In some cases however you may find doorbells with rechargeable batteries. 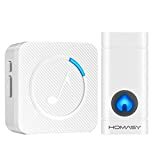 This may in some cases be a separate product, but it might also be a feature included in an all-purpose wireless doorbell. A pet chime alerts you when your pet needs to go outside or come back in. It is a great way to train your pet not to scratch or bark. Now you know about the benefits of a wireless doorbell and why you might want to install one in your home. With it, you can hear your doorbell from every room of your house, and you can customize the system completely to reflect your personality. Ready to start shopping? Scroll back up to the top of this page to take a closer look at our comparison chart. 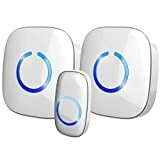 There you can view features and pricing for top-selling, highly-rated wireless doorbells on Amazon.com. If you’re shopping for a wireless doorbell that has a simple, streamlined appearance, but which boasts a wide range of features, the SadoTech Model CXR may satisfy your requirements. This doorbell offers excellent range, a wide variety of chimes, and more. Sleek design. The minimalist aesthetic of this wireless doorbell is definitely among its greatest appeals. No matter the style of your home, it should fit in nicely, and offer a pleasing contemporary vibe. Never miss someone ringing your doorbell. One great feature of this doorbell is that it includes two plug-in chimes. These can be placed in different parts of your house. That way, no matter where you are when the doorbell rings, you will not miss it. With 52 different chime sounds available, you’re sure to find something that you like. You can also adjust the volume up or down for your convenience and comfort. Multipurpose. While this device is designed principally to function as a doorbell, it can be used in other ways as well. For example, it can be set up to function as a pager for a person with limited mobility. Easy installation and use. You can get set up quickly with this doorbell even with limited expertise. You should also find it intuitive to use once it is ready to go. This device may sometimes have a short life span. This seems to be a flaw which has only affected a limited number of units. 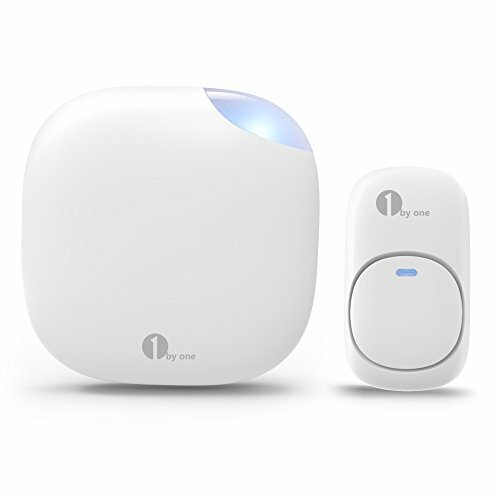 Customers who are looking for a budget option for a wireless doorbell should consider the 1byone Easy Chime. This beautifully designed doorbell is very affordably priced, but offers excellent features and versatility as well as 500 feet of range. 500 feet of range. This should be adequate for most small to midsized homes. Lots of ring-tones to choose from. There are 36 available in all. That means that there is something to suit every preference. You can also adjust the volume to any of three settings ranging from 25-110 dB. if you prefer, you can set the receiver to flash an LED light at you instead, or produce both the flash and the sound simultaneously. Connect additional units. If you want to expand the range of the system, you can scale it up by adding more receivers and doorbells. Weatherproof. The doorbell has an IP44 rating, so it can stand up to the elements. Multipurpose. While this device is designed as a doorbell, it can also be used as a paging system. Effortless installation. Installing the doorbell is as simple adhering it wherever you want to put it. It comes with adhesive tape already attached to it to make this as easy as possible. No drilling is required. After that, it is simply a matter of plugging in the receiver to pick up the signal. Appealing design. The minimalist look of this doorbell helps it blend into any environment. This doorbell gives false alerts. Sometimes this doorbell goes off for no discernible reason. This does not happen with every unit manufactured, so presumably it is a flaw which is restricted to certain batches only. 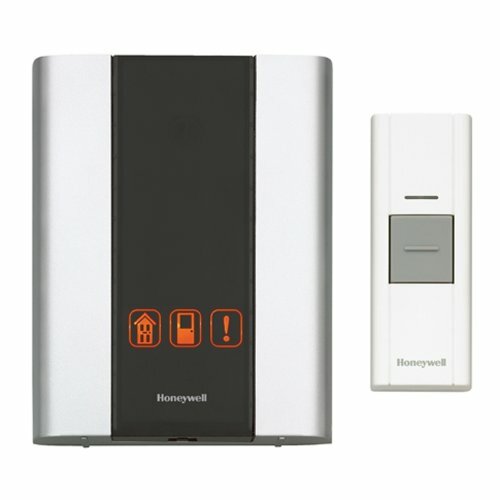 Because it’s so easy to setup and expand, Honeywell RCWL300A1006 could be one of the most user-friendly wireless doorbells on the market today. Fans of this device appreciate its no-hassle activation system and its simple yet useful LED indicators. If you need more range, you buy an optional extender and pair it to the network with the press of a button. Set it up anywhere. This doorbell works just as well outside as it does indoors. Futuristic design. This gadget’s sleek silver and black color scheme and its slim shape allows it to blend in well anywhere. Intuitive display. LED indicator shows you security alerts and lets you know when it’s time to install new batteries. Home security integration. Link this chime up to your motion detection system and it’ll go off automatically if it detects an intruder. Range extender system. If you need to extend this doorbell’s 225 foot range, you can order optional range extenders from Honeywell’s website. Easy setup. All you have to do is pop in batteries, pair the doorbell up with the receiver and then mount the doorbell with the included screws. Add additional doorbells. If one doorbell button is not enough, you can easily buy and pair up additional ones. Other portable doorbells give you loads of different chimes to choose from, but with this one you only get 3. Many wireless doorbells on the market are designed for smaller homes and offices. If you live in a larger building, you may require significantly more range than these competing products offer. If that is the case, you want to check out the Avantek D-3B. Fantastic range. Whereas as many other doorbells only offer around 500 feet of range, this one provides you with 1,300 feet. Includes two receivers. With two receivers, you can hear the bell clearly throughout your home. High-quality chimes. There are 52 different chimes that you can pick from, all of them with beautiful, clear sound through a 40 mm stereo speaker. You can adjust the volume to any of five different levels up through 115 dB. One nice feature this doorbell has which a lot of competing models do not is the ability to store your preferred settings even through a power outage. This means you do not need to spend a lot of time resetting them. Long battery life. The 230 mAh CR2032 lithium battery which comes with the device can last for three years before it has to be changed. This unit seems susceptible to rain. This is surprising, considering it has a rating of IP55. That should be sufficient to protect it, but some units are damaged by exposure to normal precipitation. Disclosure: TwoWayRadioTalk.com is a participant in the Amazon Services LLC Associates Program, an affiliate advertising program designed to provide a means for sites to earn advertising fees by advertising and linking to amazon.com. How do you know that the 1byone can work in temperatures up to -22? I need one that can work in that temperature. I think the only way to know for sure would be to contact the manufacturer directly and ask. Here is the support page.